In the evolution of the man’s wristwatch from a novelty to a rugged piece of military hardware, several components of the wristwatch needed to be improved or, in some cases, invented. Let’s take a look at each of those components now. In this installment, we'll look at movements and dials. Cases, crystal guards, and bands will be examined in the next installment. Movements. Of all the movement sizes available by American manufacturers at the time, the war department decided that the 3/0 size was the most optimal size for a man’s wristwatch. Other sizes were certainly available, and we see surviving examples today, including 0-size, the 6-size, and even up to a giant 12-size in rare instances. But I would say that most of these larger sizes were seen on officers’ watches that were bought and paid for by the officers themselves. For the military issued watches for your average “grunt” on the ground (and the few pilots in the air) the 3/0 was the size of choice. Three companies --- Elgin, Waltham, and Illinois – made 3/0 movement that had proven reliable. Let’s see what effect the war had on production. Here is Waltham’s 3/0 grade 365, probably the most used movement in Waltham trench watches. 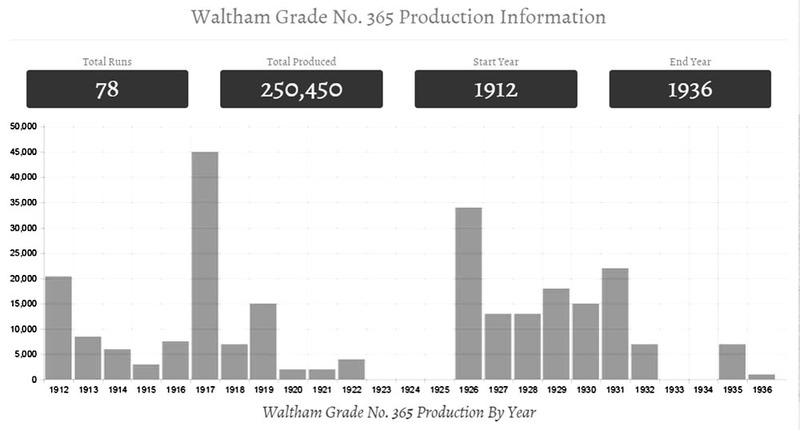 Look how production spikes in 1917 to 45,000 units from 7,550 the year before. Here’s another Waltham movement, the 3/0 size grade 310. 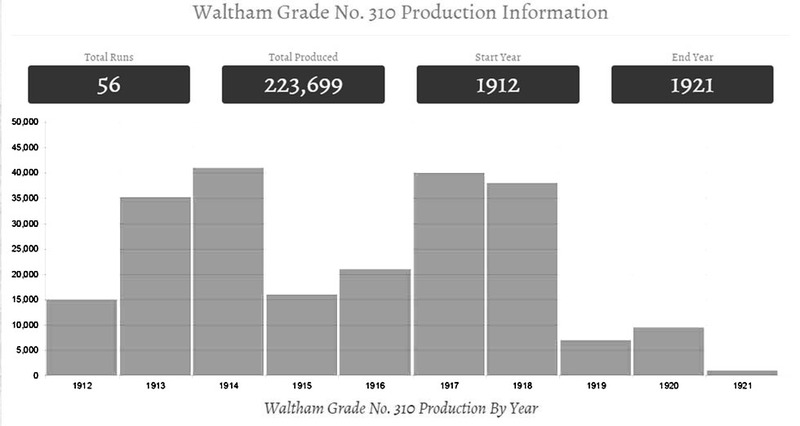 Production spiked from 21,000 units in 1916 to 40,000 units in 1917. Similar spikes in 3/0 size production can be seen with Elgin and Illinois. Hamilton, by the way, was not in the game. 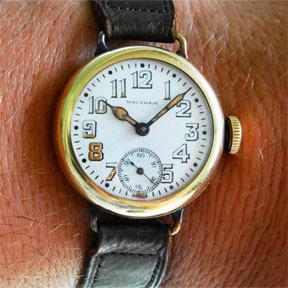 They had just introduced a 0-size wristwatch in 1917 and produced them in very limited quantity, just 500 units in 1917. They did not offer a wristwatch with a 3/0 size movement. Before we move on to the next component, you should be aware when considering a trench watch purchase that the AGE of the movement, as reflected by the serial number on the movement, must be consistent with war time production. 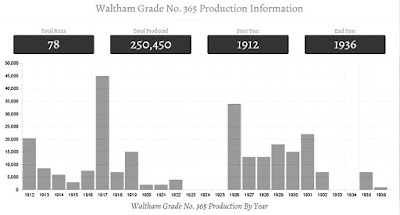 With Waltham, for example, serial numbers should be somewhere between 20,900,000 and about 22,000,000. Serial numbers can be easily found for all American watch companies on a number of online databases. Nothing kills the value of a trench watch to a true collector than a transplanted movement from a different era. Unfortunately, this occurred all the time, and still occurs to this day. Watchmakers would routinely transplant movements in customers’ watches where the existing movement was too much bother to fix. And the practice, unfortunately, persists to this day by dealers and careless collectors who replace movements with age-incorrect ones, or make up a watch using pieces from disassociated watches. By the way, there is nothing wrong or incorrect about transplanting an AGE-CORRECT movement into a watch whose current movement is beyond repair. This is restoration, as opposed to jury-rigging, and it is performed all the time with collectibles across the gamut. It would be no different than replacing an engine in a Model T Ford with another factory-made, age-correct Model T engine. You would not, however, replace a Model T engine with the Ford Flathead V8 from a 1932 Model B Roadster! You get the idea. In any event, be aware of “put-together” watches in this genre. 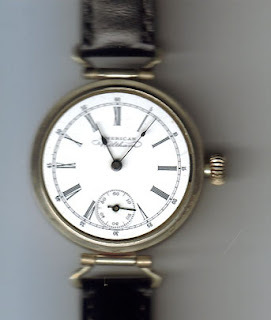 Perhaps no other types of watches have been so “fiddled with” than trench watches, due in great part to the fact they have simply been around longer than any other wristwatch! Dials. At first, 3/0 movements were used in ladies wristlets or pendent watches. Dials were white enamel with fairly delicate Arabic or Roman numerals. The first wristwatches for men often kept the same dials, so this is perhaps one more reason wristwatches were considered too feminine for men. But as the war clouds gathered and it became evident that America would join in the Great War, dials for men’s watches became bolder to make them easier to read. 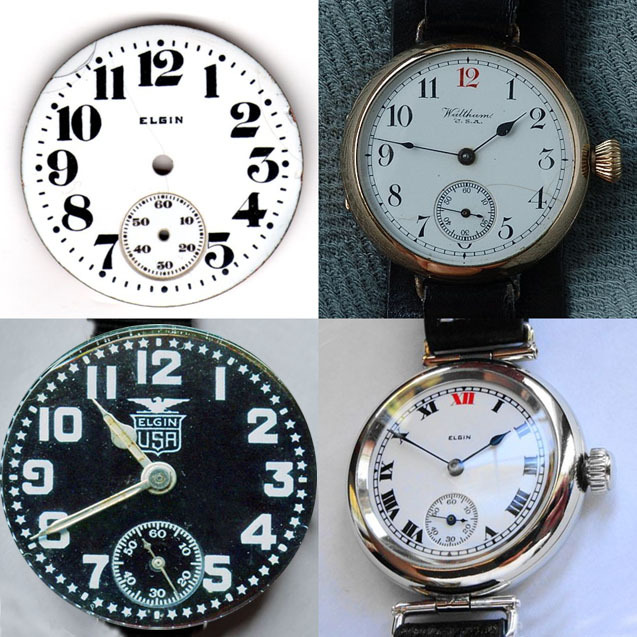 Watch manufacturers, including Waltham, Elgin, Illinois and Hampden came out with dial designs with larger, heavier numerals. Minute tracks became bolder to more easily tell time to the minute. Hour, minute and second hands became fatter with a more masculine look. The most widely manufactured dial, however, and the one specified by the U.S. military, was the luminous dial for its ability to be read in the dark. This is the dial (below) you will see most frequently on World War I trench watches. Notice how much of the old luminous has flaked off the dial. This is perfectly normal, and many collectors prefer original dial to having the dials "re-lumened," but this comes down to a personal choice by the collector. Want to learn more about WWI trench watches? My good friend and fellow historian, Stan Czubernat, has recently published his second book on Waltham WWI trench watches to compliment his first book on Elgin trench watches of the Great War. Together, these two volumes comprise a wealth of information about trench watches. The books are "must-haves" if you are thinking of collecting these great old watches. Click on the image below to obtain ordering info, and also have a look at the watches Stan has for sale.